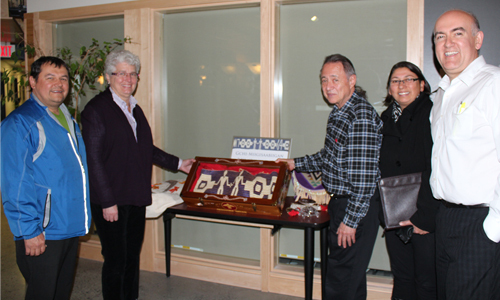 We are proud of our partnership with the Truth and Reconciliation Commission of Canada (TRC). The TRC was established as a result of the 2007 Indian Residential Schools Settlement Agreement. Its mandate is to inform all Canadians about what happened in the 150-year history of the residential schools, and to guide and inspire a process of reconciliation based on mutual understanding and respect. In 2012, Barbara Hall was named an Honorary Witness to the TRC, and we worked together on some key events. In June 2012, Barbara Hall and Commissioners Maggie Wente and Larry McDermott hosted a session at “The Meeting Place,” a two-day intergenerational regional gathering. This event, hosted by a cooperative of Aboriginal and supporting organizations, was designed to “promote respect, education and engagement on the Indian Residential School System.” In a session on “Human rights in Ontario: From Rights to Reconciliation,” we provided information about the Human Rights Code, Ontario’s human rights system, and how the OHRC can play a role in reconciliation. We also asked people to continue the conversation with us, by letting us know other ways that we could support reconciliation and respect for the Aboriginal Peoples in Ontario. In August 2012, the OHRC partnered with the TRC to present “Shared Perspectives, An Evening of Reconciliation” as part of the Planet IndigenUS Festival at Harbourfront Centre in Toronto. This evening featured TRC Chair Justice Murray Sinclair, performances by dancers and drummers from the Aboriginal and Black communities, and an authors’ dialogue between writer-storytellers Itah Sadu and Richard Wagamese, moderated by broadcast journalist Shelagh Rogers. This event widened the reconciliation conversation between Aboriginal communities and other racialized Canadian communities. Barbara Hall took part in discussions on human rights issues affecting First Nations people at the Union of Ontario Indians head office on Nipissing First Nation near North Bay. From left to right: Melvin McLeod, Human Resources Manager, Nipissing First Nation: Barbara Hall: Maurice Switzer, Director of Communications, Union of Ontario Indians: Nancy Potvin, Program Manager, North Bay Indian Friendship Centre; and Fred Bellefeuille, Legal Department Director, Union of Ontario Indians. The group is seen with the Covenant Chain Wampum Belt exchanged with the British at the Treaty of Niagara Congress in July, 1764. In accepting the Wampum, many presents and promises by the Crown in Canada, Indigenous peoples around the Great Lakes accepted the terms of the 1763 Royal Proclamation, which recognized them as Nations – peoples with inherent rights. These rights are specifically mentioned in Section 35 of the Constitution of Canada.